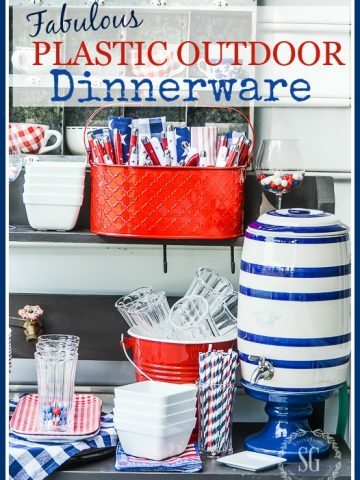 I’m very excited to be participating in my first Tablescape Thursday at Susan’s Betweennapsontheporch.blogspot.com. I have thoroughly enjoyed all the fabulous tablescapes, dishes, beautiful centerpieces and creative ideas every Thursday. Be inspired… check it out. Happy Birthday, Bobby (husband) and Christopher (Son)!!!! We celebrated with a family dinner. I will post the menu and a great recipe on Friday. We are very good at turning celebrations into big events, and this was no exception. 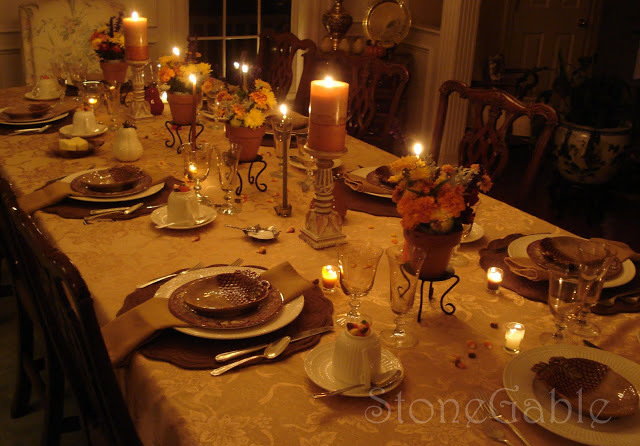 Birthdays are perfect times to get out the dishes and set the dinning room table and honor the ones you love. Spending time lingering at the table gives us all a chance to reconnect and share our lives and love with one another. What could be better? For Bobby’s gift I had a photographer come and take a family portrait. This is a sample pix – I can’t wait to see all the pictures! I love fall! I am so happy that we have something special to celebrate together in October. I chose a warm Autumnal theme. This year, fall decorating has taken a warm, softer tone. I wanted my table to glow… so of course lots of candles and not a lot of color contrast. Dinner was served at 4:00 and lasted way beyond dark. I always try to take a substantial break between the main course and dessert if possible. People can then gather in smaller groups with coffee or tea for intimate chit-chat. I can clear the used dishes. I put them in dishpans and put them in my laundry room (next to the kitchen). That way I am not at the sink or dishwasher and the dishes are out of the way soaking. By the time dessert is served everyone is ready for something sweet. Mixing creamy whites with the earth tones adds nice highlights without getting too “color loud”. The white plates are my everyday dishes. 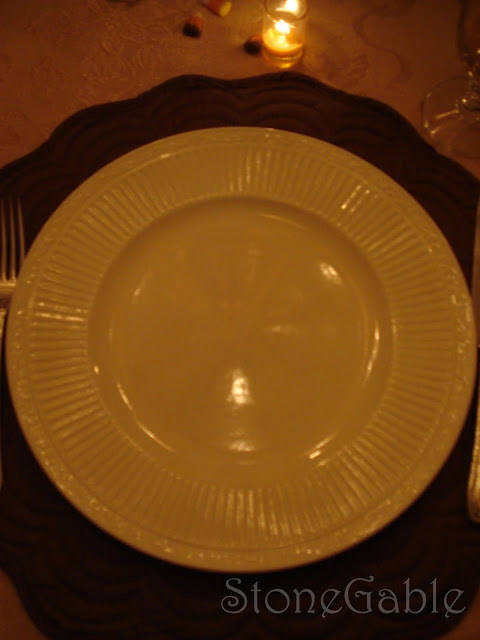 I like to serve food on white plates… I think it lets the food be the star. 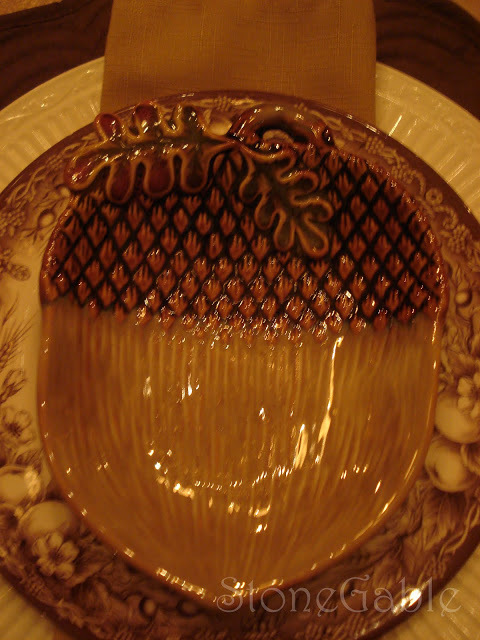 I picked up these sweet acorn plates at a wonderful shop nearby… The Old Millhouse Shoppe. They are a perfect size for appetizers or desserts. I also used one as a butter dish. I picked up these brown transferware plates at Home Goods . Thanksgiving is at my home this year and I plan to use them to serve salad. They are so pretty, I couldn’t resist using them now. The workhorse of my dishes… Mikasa Italian Countryside. I started collecting them before they got ridiculously expensive! Because I use them so often I have collected a set of 24. Many are chipped by my porcelain sink ( bad investment, not very forgiving) but I see chips as being “well-loved”. Silver is so beautiful and reflective. 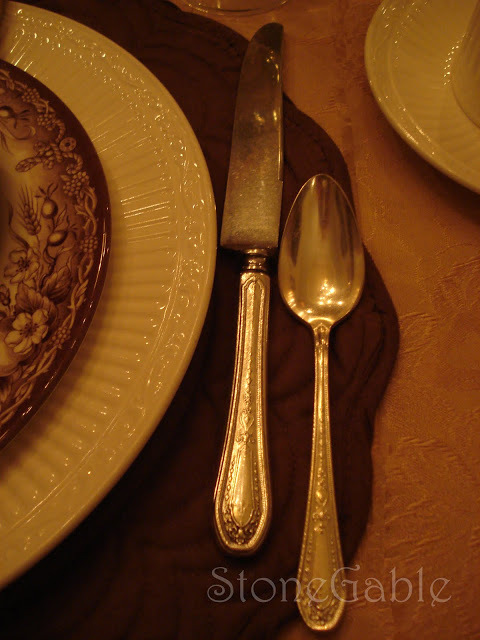 I got my flatware at a flea market, can you believe it? Me neither!!!! I asked the vendor if he knew what he was selling ( I felt guilty buying them for so little) and he said yes, so for $28.00 I got 11 place settings. It is priceless to me. I love polishing it!!!! Just for fun, I turned the coffee cups over and put little Halloween candies on top of them ( It also hid the Logo). I put a coffee spoon through the handle of the cup. My marigold are having a riot in my garden, so I used what I had to make 4 centerpieces. 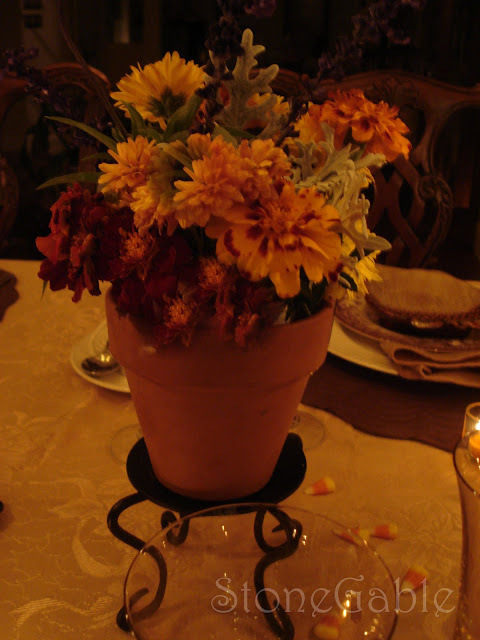 Small terracotta pots on rod iron pedestals showed off each arrangement. 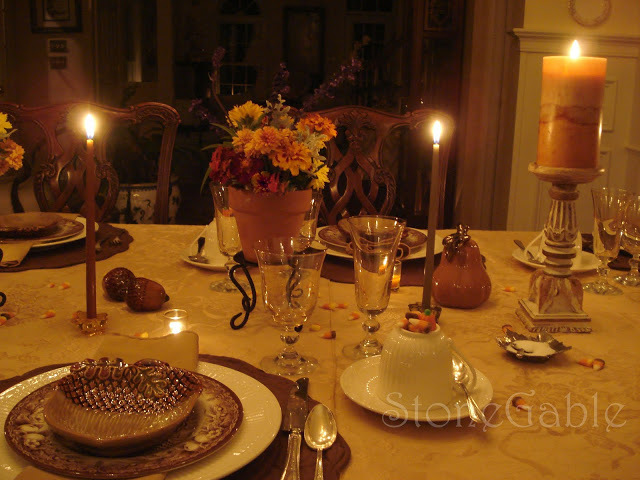 Two worn wooden candlesticks were topped with fat candles, and tiny votives gave a warm glow close to the table. 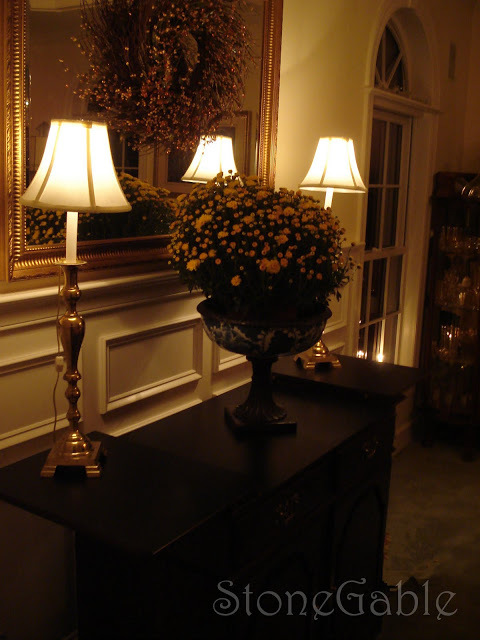 Four tall thin candles in glass leaf bases (Wm- Sonoma) were also used to give more light. Because I served 10 at my table, I gave everyone some elbow room. 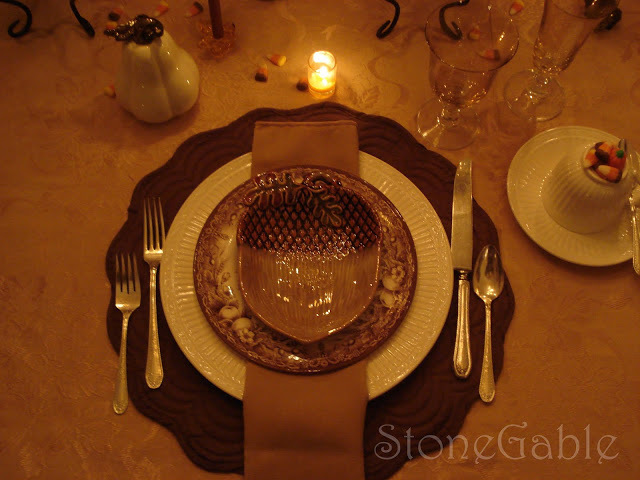 To fill in empty spaces I used 3 porcelain gourds and 2 acorns to add a little interest, as well as strewing candy corn for a fun punch. My buffet with a big mum. What a wonderful memory-making time! Happy Birthday, boys… I love you! What a lovely table. 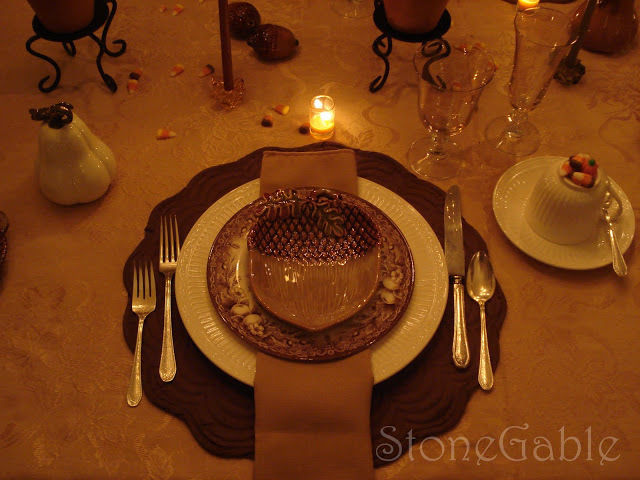 I love the acorn bowls and turkey plates. It all looks so warm and inviting. I’m sure it was a great party. What a beautiful table! Your placesettings are wonderful! I love those turkey and acorn plates! Great job! 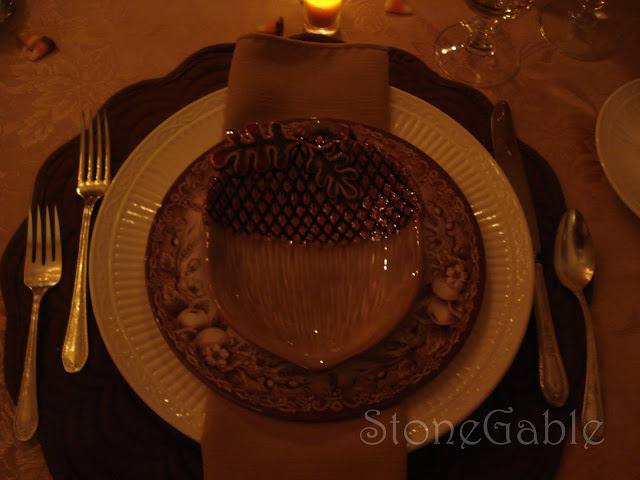 Wow, I am in love with those wonderful acorn dishes! Wish I could find some as cute. Happy Birthday to all! Now that is a beautiful table. 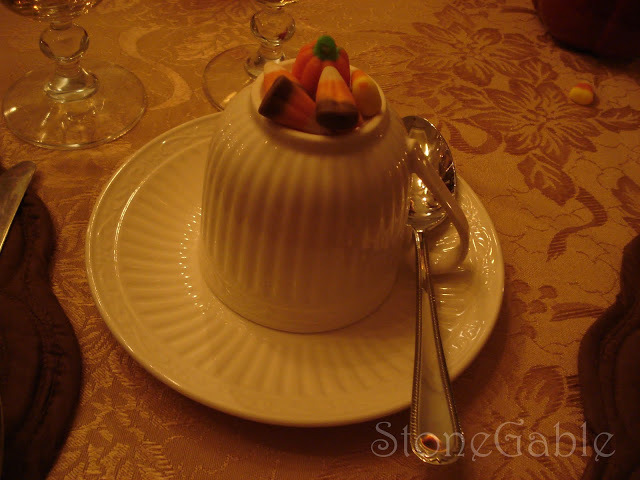 I love the little acorn dishes and the clever idea of flipping the cups and adding the candy. I’m sure your family appreciated all the “fuss”. You love polishing your silver? I gave mine back to my mom because I didn’t want to keep up with it. 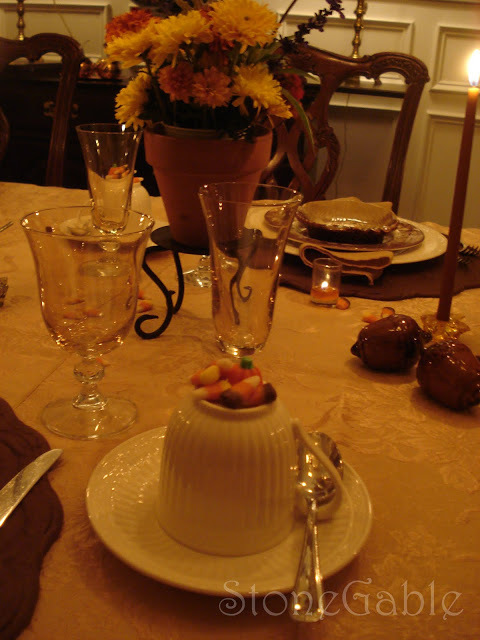 Of course that was before I discovered Tablescape Thursday. Wow! Your table is so elegant! Happy Birthday to your men! What a lovely photo and splendrous table setting. I guess you should be able to set one up with a big family. Have a wonderful evening! Very pretty and very elegant! 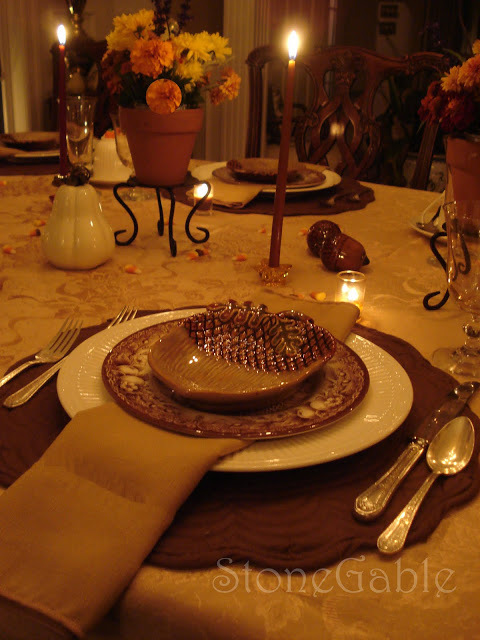 I love the brown hues you’ve used in the table linens and turkey and acorn plates. I’ve been seeing a lot of fall things with acorns this year, and I just adore them. Thanks for sharing and happy TT to you! How nice of you to create such a beautiful tablescpe for the men in your life! I LOVE those little acorn bowls! I like your comment of chips on plates means they are well loved – so true! What’s the point of never using dishes in case they get chipped? Happy Birthday to your guys! And welcome to Tablescape Thursday. Your table is lovely. 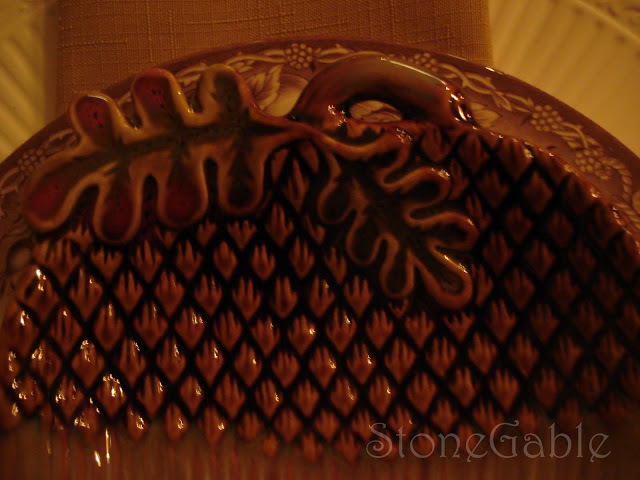 I like the acorn plates and the transferware plates in the brown. Thanks for sharing this beautiful table. Yvonne, You have a beautiful family! 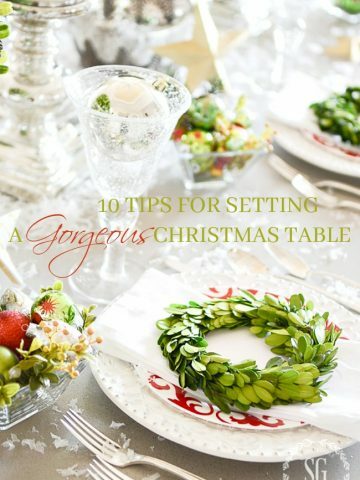 Your tablescape is stunning and I especially love your little acorn plate. 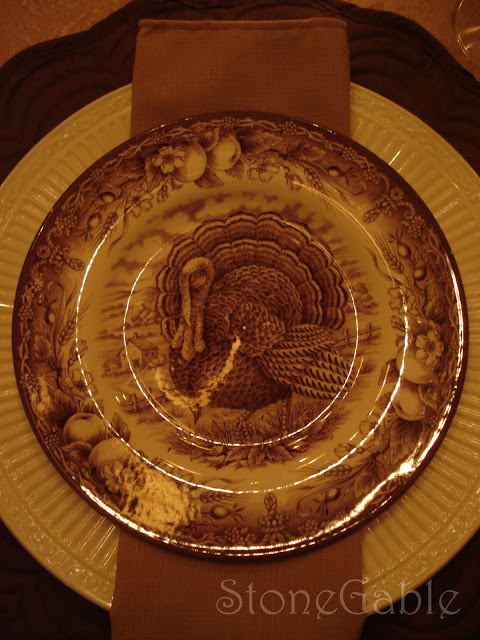 I’ve been eying those turkey transferware plates at HG. They are so pretty. I really like your table. The little acorn dishes are darling. You have a very nice looking family…and a happy birthday to the special men in your life. Very pretty! And such a nice family photo!! COOL! Those turkey plates are so nice–I saw one somewhere the other day! 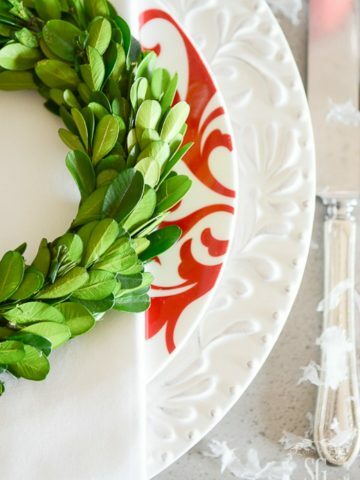 I like white plates because they go with everything! I like the little stands that held your flowers–quite pretty! 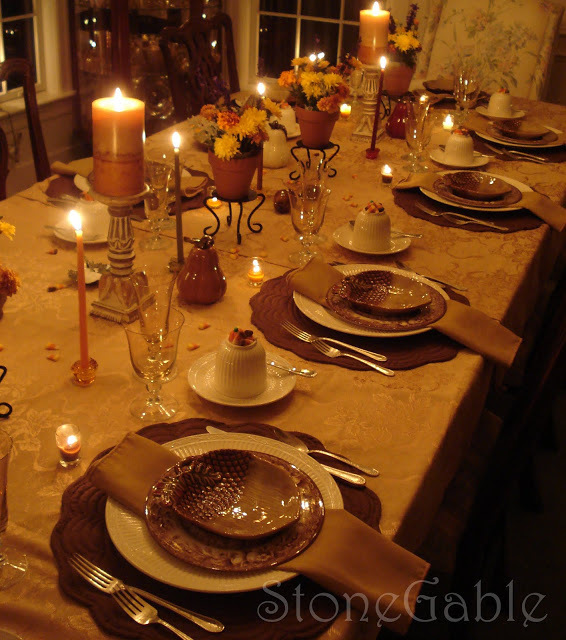 You did a beautiful table for a family celebration. And the picture is lovely! 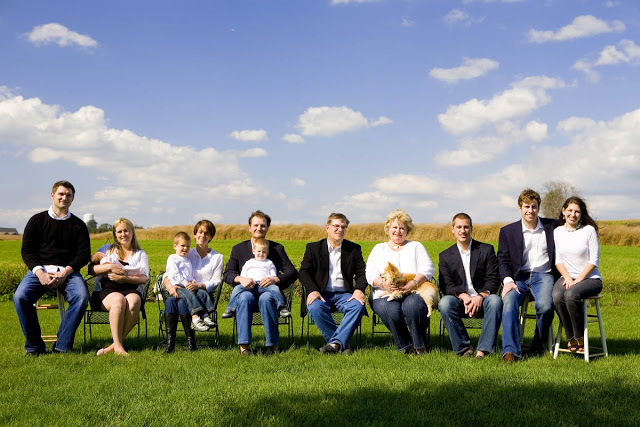 I want a family pic so bad…Love the sitting idea! What a beautiful family picture! Love it! And your table is very welcoming. Welcome to TT — hope you’ll be back soon. Beautiful table and family. Happy birthday to everyone! Thank you for sharing. Your table is gorgeous! I love the touch of the candy corn. Happy Birthday to your boys!